The TOQ Summer issue is up. Subscribers Needed! The Summer issue of TOQ is available for subscribers, with the print version to be mailed out soon. 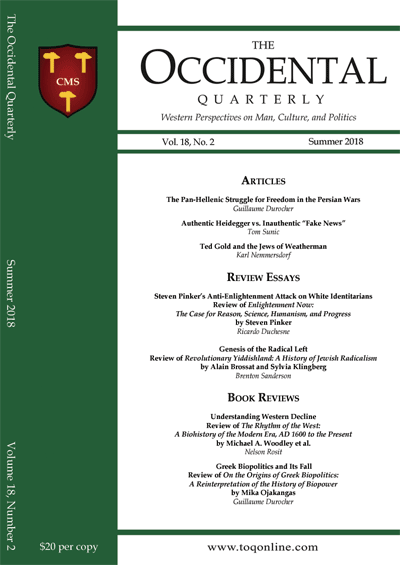 It’s a great issue with articles on a wide range of topics vital to understanding Western culture, Western history, and the struggles we face. I strongly encourage people to subscribe. As is well known, the establishment is attacking us on all fronts, and PayPal in particular has been a problem. TOQ has lost many subscribers because their automatic renewals were not processed after PayPal cut us off. The result is that we are struggling—especially frustrating because we had almost achieved the break-even point. It’s very important for our side to be able to put out a high-quality journal. One of the strengths of Jewish activism has always been that Jews would support magazines and journals that were overtly (e.g., Commentary) or implicitly (e.g., Partisan Review back in the 1940s and 1950s). We should be able to do the analogous thing and support media that takes our side. Subscription information is at www.toqonline.com. For US subscribers, it’s simple: $30.00/year for a digital subscription and $60.00/year for the print journal (includes digital access). We have been able to get a credit card processor. For anyone who wants to send a check or money order, please send an email to support@toqonline.com, and you will be provided with further instructions. Karl Nemmersdorf on Ted Gold and the Jews of Weatherman, the 1960s group of radicals. Nelson Rosit reviews The Rhythm of the West: A Biohistory of the Modern Era, AD 1600 to the Present by Michael A. Woodley et al. https://www.theoccidentalobserver.net/wp-content/uploads/2018/07/toq-summer2018-cover-sc-400x565.png 565 400 Kevin MacDonald https://www.theoccidentalobserver.net/wp-content/uploads/2018/06/TOO-Full-Logo-660x156-1.png Kevin MacDonald2018-07-04 08:22:062018-07-14 11:43:55The TOQ Summer issue is up. Subscribers Needed!